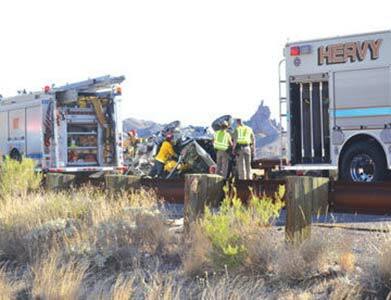 Bullhead City, Arizona—A single-vehicle rollover accident on SR-68 east of Bullhead City on Tuesday afternoon left one person dead and six others injured. The vehicle was so mangled that emergency responders had to extricate the victims from the wreckage. One person died at the scene and another was transported by Careflight to a Las Vegas hospital in critical condition. The remaining five occupants were transported by ambulance to Western Arizona Regional Medical Center. Personnel from nearly a dozen agencies responded to the scene. No additional information presently is available regarding names or medical conditions of the injured. The accident investigation continues. We extend our sympathy to the victim’s family and friends over this tragic loss and we wish swift and complete recoveries for those who were injured.